In order to create the most truly challenging MMOs that connect players with the specific virtual environments they’re traversing, developers have always worked on unique ways to make navigation and adventuring as important to the MMOverse as every other way to play trope. At the core of any good exploration-heavy MMO should lie a solid set of movement mechanics that enhance the explorative experience and add layers of challenge or intrigue to the game at hand, rewarding the brave adventurers among us for completing epic journeys across dangerous environs. Those same movement mechanics can also bleed into an MMO’s combat system to create a more complex, engaging encounter that provides a fantastic potential for differentiation between enemy types in specific zones. 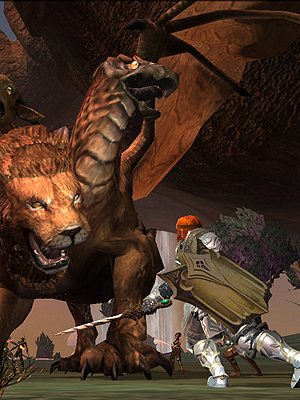 In this edition of MMO Mechanics, I’m going to run through some of my favourite movement mechanics, discussing their best implementations and how they enhance some of the MMOs that employ them. Regular readers will be aware that I also write our Guild Wars 2 column Flameseeker Chronicles and that the game’s first expansion very recently introduced whole set of zone-specific movement systems to the MMO. Top of the list is a full mastery line that teaches your characters how to glide around the Maguuma jungle, a rich, dense environment that’s a fantastic experiment with verticality in MMO maps. The map verticality in pre-expansion content ranges from simply absent to intensely frustrating, so the introduction of gliding in Heart of Thorns really was game-changing. The mechanics are surprisingly refined for such a new addition to the game and key features include the ability to hit updrafts for increased height and flight duration and the ability to lean while mid-glide to affect the speed at which you glide. 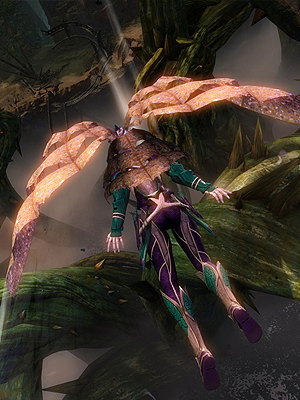 With Heart of Thorns, the ArenaNet team used gliding to both make the new jungle zone feel much more expansive and ensure that the new raids had a clever difficulty layer added. The masteries are required within the first raiding tier, and one fight in particular employs some very white-knuckle use of gliding to help players avoid wipes. Gorseval is a scary arm/tentacle monstrosity that fills his entire platform with death-causing nasties at a regular rate, so players need to strategically time jumps off the platform as this happens. The real challenge is finding an updraft to hit in order to gain more height so that you actually make it back to the platform when the coast is clear. While Guild Wars 2‘s gliding mechanics are limited to a single zone, plenty of other games have implemented gliding that isn’t so restricted. My favourite of the lot has to be the gliding ability of EverQuest 2‘s Fae race, an ability that was later reimagined in gliding and leaping mounts. On the surface, EVE Online‘s jump drives and portals might seem like a simple fast travel mechanic, but this movement system is actually a strategic gem for combat. One ship opens a cynosural field and then massive capital ships in the fleet can then instantly jump to that location from up to several lightyears away. A titan can also open a jump portal to that location, allowing smaller sub-capital ships to jump to the cynosural field too. Cynosural fields can be used to hot-drop capitals on top of opposing players as even a tiny frigate can fit the module required to generate them. In fact, there are many corps that set up traps in which a seemingly defenseless ship is used as bait to lure in attackers with the intention of lighting a cynosural field to call in the main fleet. Jump drives and jump portals add another strategic layer to large-scale conflicts, almost turning the fight into a game of poker in which you never know what the other side has until they show their hand. Alliances often keep ships in reserve in order to force the other player to drive up the stakes by fielding more and more of their own fleet, or call in allies for help when they’ve misjudged the enemy’s true numbers. This kind of escalation is what caused the famous battle of B-R5RB in which ships worth an estimated $300,000 were destroyed. One titan pilot accidentally jumped his ship into the battlefield instead of opening a jump portal, and players from both sides of the conflict piled in to try to either save or kill the titan. The ability to surprise enemies with ships appearing out of nowhere also increases the emphasis placed on spying and intelligence-gathering gameplay. With accurate intelligence on what forces the enemy can field or how many capital pilots they have online, strategists can better estimate how much to risk and how far a given battle will escalate. Since jump ranges are limited, good intel gathering can also tell you whether or not the enemy capitals are even able to be quickly employed at a given location or how long it will be until reinforcements arrive. 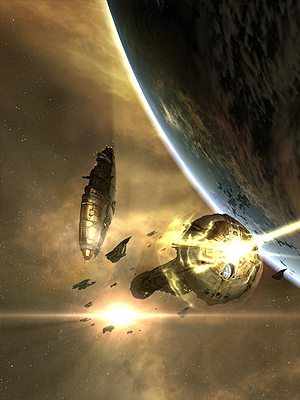 While there’s always debate over the state of capital warfare and jump drives in EVE Online, the ability to hit the enemy in the face with 200 ships out of nowhere is definitely a game-changer and a big part of the strategy of war. There are so many different sprinting or speed mechanics in MMOs that you may be scratching your head in bemusement as to how it made my list. I have to give a special mention, though, to those speed mechanics that elicit a fight-or-flight response in players by forcing them to either commit entirely to fighting an enemy or running from it in the first few moments of combat. Several MMOs have managed to accomplish this nicely despite sprinting one of the most basic movement mechanics in MMOs, the result having a major impact on gameplay. EQ2‘s sprint is actually pretty elegant in its simplicity, with characters consuming a percentage of their mana every second in exchange for a significant speed buff. The idea is to force players to commit to fighting because if you’re already in trouble then you probably won’t have the mana to save your neck. It’s not a good disengagement mechanic for a combat that’s already tipped past the point of no return, but couples well with out of combat mana regeneration from drinks and totems since this will allow you to run much further when you’re not already entangled in combat. It was also very interesting in PvP too as players often couldn’t chase down fleeing opponents and still have enough mana to kick their heads in. Age of Conan‘s old sprint ability drained stamina instead of mana, with the difference being that melee attacks also use up stamina. This allowed spellcasters to hit and run more effectively, as would be natural to such lightly armoured classes. This variation of the sprint mechanic has been used in several games and is an elegant way of tying gameplay styles to the core mechanics rather than just to stats on gear and character builds. Melee classes can have a higher base stamina and so can run for longer durations, allowing them to chase targets down before attacking, but they’ll be too exhausted after a big attack to immediately sprint after a fleeing enemy. These three movement mechanics were the first to pop into my head when I considered the question of how such mechanics can radically enhance the player experience, but I’m sure you’ll have your own list to add to mine. What movement mechanics are employed in your favourite MMO? How do those mechanics enhance the game? Let me know your thoughts in the comments below. Wildstar’s double jump has me radically disappointed when I press the spacebar key in any other MMO, expecting to be able to hop like a silly idiot but I’m instead met with a somewhat “eh” feeling single jump. I’m surprised Wildstar hasn’t been mentioned. Between being able to double jump and hoverboards it has some of the best feeling movement in any MMO I’ve played. The explorer path also has little flags through areas that they can touch for a stacking movement speed buff. Grab enough of those and you can basically fly across the zone at super speed, it’s pretty amazing. fangGWJ I think most people who hate on GW2 underwater combat forget how terrible it is in most other MMOs where you literally just use the same skills you do on land, which in most cases doesn’t make any sense whatsoever. Siphaed Styopa While it is more integrated, it is not ground-breaking, and I think some earlier renditions (such as AA) should have at least gotten a shoutout, as I’m sure they had at least some impact on the system that was taken up (and made far better) by GW2. Polyanna The restrictions make it more interesting, in my opinion. It allows unique puzzle, exploration, and even combat elements to be added without trivializing the whole thing and still providing a sense of that freedom of movement. Super Speed in DCUO was a blast with being able to not only run super fast but also run super fast up buildings and then rocket off into the sky with a super speed-propelled leap. Leaping between buildings and stuff like that was just so fun. Also out of all the MMOs that have used gliding, ArcheAge has probably been the most enjoyable one for me since there’s so much cool hidden things out in the world to find with some clever gliding. From my experience the stuff that was more difficult/challenging to reach often led to being the most rewarding. And in general the gliding just felt very natural and fun. Global Agenda’s jetpacks were also pretty fun. Same goes for Tribes Ascend’s skiing/jetpack combo. Though those are more shooter oriented than strictly MMO based. Climbing in EQ2 was novel for it’s time. The first thing to pop into my head was AVATAR COLLISION DETECTION. It’s more of a limitation on movement than a new way of moving but it greatly affects how you move around in a game. After playing Age of Conan exclusively for over a year, I tried some other MMOs and though I eventually got used to floating through other avatars, at first I felt as if the games were horribly horribly broken.